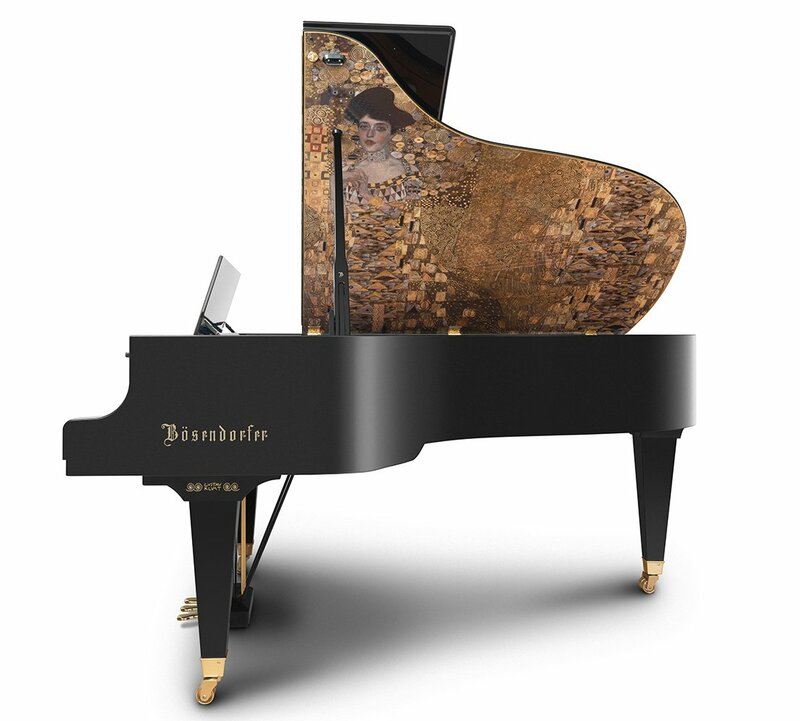 There will be just 25 of the beautifully hand-crafted Klimt models made, and will no doubt prove what Bösendorfer’s highly skilled craftsmen are capable of. The instruments are being made with the cooperation of the Belvedere Museum in Vienna who have the most extensive collection of Klimt paintings in the world, including the iconic The Kiss on which the first Artist Series piano is based. Bösendorfer took the Belvedere’s own high-resolution image of The Kiss and utilised highly advanced reprographic techniques to render the painting on the inside of the 200 model grand piano lid. The reproduction of the world famous image has been made even more realistic with the addition of real gold leaf. Further Klimt-like design elements have also been added to the piano. Inspired by the artist’s use of asymmetrical organic lines, Bösendorfer have created special lines on the music desk and on the legs of the instrument. These lines are also inlaid with gold leaf. Each instrument will boast an individually numbered brass plate and the 25 customers will receive a signed copy of the book Gustav Klimt /Josef Hoffmann, Pioneers of Modernism, co-edited by Alfred Weidinger, Vice Director of the Belvedere Museum. As well as the architectural and product design for which Hoffmann was famous, he also designed a Bösendorfer piano. Gustav Klimt ( 1862-1918 ), one of the most famous Austrian painters and artists of the Viennese Art Nouveau, and Bösendorfer, both greatly represent Austrian culture, dedicated craftsmanship, as well as artistic expression. The second model of our Klimt Series is dedicated to the portrait of Adele Bloch-Bauer. In 1903, Ferdinand Bloch-Bauer, wealthy entrepreneur and connoisseur of great art, asks Gustav Klimt to portrait his wife. Klimt agrees and in the same year, travels to Italy. The gold-decorated church mosaics inspire him to translate this rich artistic expression to contemporary art. The following years, Klimt produces more than 100 sketches and studies for the dedicated painting. He experiments with various techniques until he succeeds in applying extensive amounts of silver and gold leaf to the oil painting. With sophisticated reprographic techniques the high resolution image of the original painting was reproduced on the inside of the Bösendorfer Grand Piano lid. Further, the Klimt painting has been refined by the skilled application of gold leaf. Our Bösendorfer Artisans lavishly gilded the music desk and the leg tops to reflect the golden expression of Art Nouveau. The Klimt model is limited to 25 instruments and each Grand Piano carries an individually crafted brass plate. A sincere tribute to precious materials and lavish art. The exclusive book “Gustav Klimt / Josef Hoffmann, Pioneers of Modernism” complements our Collector’s Edition. Published for an exhibition at the Belvedere Museum Vienna this book centres on the Modernist Movement at the turn of the century. Art, music and craftsmanship – a symbiosis of all levels of Austrian culture. Our Bösendorfer Artist Series Klimt Woman in Gold.